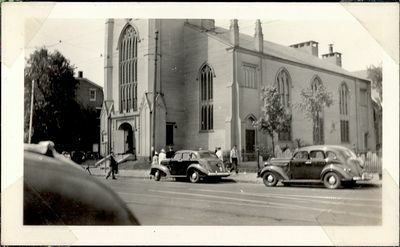 Photograph of the First Parish Church (Unitarian) in Cambridge, Massachusetts from across the street. There are several people walking in the streets and two cars parked in front of the church. The church is where the Lesley School students graduated. Black and White photograph, glossy; 11.6 x 7 cm with border; writing in black ink on back.